Getting around Barcelona by public Bus - All the info about buses in Barcelona: timetables, prices and routes. 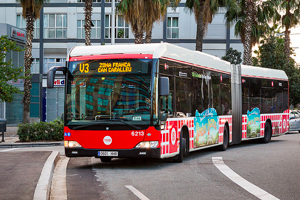 In this article we'll provide more detailed information about the buses in Barcelona, covering public buses such as the "Tourist Bus," the regular bus service and also the night buses. You will find useful information regarding which bus to choose and how best to get around Barcelona by bus. Do you want to enjoy the best views that the city of Barcelona has to offer? Travelling underground on the metro obviously isn't the best option if you want to enjoy the sights but the bus service which is operated by the TMB is a great alternative for getting to know the city at first hand. The buses on the Transports Metropolitans de Barcelona network go pretty much everywhere, including places that the metro doesn't reach. The bus network in Barcelona is quite complex. As you can imagine, with such a large city, the network has to be large enough to cope with providing a daytime and night-time service for a population that exceeds more than 1.5 million inhabitants all of whom will need to go to work, return home and of course, go out in the evenings to enjoy some tapas or to a party. One of the things you should be aware of and which might strike you as strange is that in Barcelona you will find a number of buses with the letters H, V and D. What do these letters mean? Well, they actually indicate nothing other than the direction of the route they are taking. Buses on the H line, travel the city in a horizontal direction whereas the buses on the V line travel the city in a vertical direction. There is also a D line which indicates a diagonal direction. And if that wasn't enough, Barcelona also has a wide network of night buses which are known as the Nitbus, and there are plenty of those too! In total, there are 17 lines which you can use for getting to a party and coming home in the early morning! This city never sleeps and you will always be able to count on the night service when the daytime service is no longer operative. Line D20: Playa de la Barceloneta, Via Laietana, Plaza de España, Sants. Line H14: Paral.lel, Via Laietana, Parc de la Ciutadella. Line H16: The Railway station, Gran Vía, Joan Miró, Poble Nou. Line 7: Diagonal, Poblenou, Gran Vía, Gràcia, Palau Reial. Line 21: Paral.lel, Plaça de Catalunya, the RENFE railway station. Line 24: Plaça de Catalunya, Rambla Catalunya, Gràcia, Park Güell. Line 46: Paral.lel, Gran Vía, Plaza de España, Airport. Line 59: Olympic Village, Barceloneta, Via Laietana, Teatre Liceu, Plaça Catalunya. Line 65: Paral.lel, Plaza de España, Gran Vía, Plaça Catalunya. Linea 79: Paral.lel, Plaza de España, Gran Vía, Rambla Marina. If we're talking about the night buses, they all connect to the centre of the city so will be really useful if you want to explore the city by night. You can go out to the Olympic Village, la Barceloneta, L'Eixample or las Ramblas thanks to their network which includes the 17 lines mentioned above. Let yourself be driven around at night and enjoy the sights to the maximum without having to pay too much money! In order to understand pricing for the service, we recommend that you read the article about public transport in Barcelona, in which you will also find more information about the city's transport network ranging from the metro to hiring bicycles and of course, not forgetting the public and private taxis! In any event, we can tell you now that a single ticket costs €2.20 and the T10 for zone 1 costs €10.20. The tourist transport card is also available, for more info see the page: Barcelona Card. And we can't forget the famous touríst bus. This is a comfortable double-decker bus which is really great for getting to know many of Barcelona's main attractions and has an audio-guide and Wi-Fi access on board which are included in the price. If it is the first time that you are visiting Barcelona, this is a really good option as it will give you an overall view of the city and you won't have to worry about constantly changing the means of transport. Read our article for more information and additional useful details about the service. The aerobús has two lines, one for each terminal. The buses enable direct access to the airport in around half an hour. The easiest option is to wait for the bus in Plaza Cataluña or Plaza de España. Despite being an easy service to use, let's not forget about the nuisance of having to lug heavy suitcases around - particularly as they always seem to weigh more on the way home! What's the best alternative? Lose your patience waiting for one of the regular bus lines to materialise? Or, hop on the metro to catch your flight? Both these options are really useful for getting around the city but in this instance, we think that the best solution is to book a Barcelona airport taxi transfer with Taxileader.net, which will take you straight to the airport quickly and in comfort. No stress, no worries and customer service that is arranged to collect you at whatever time you need!